President Barack Obama speaks at the National Prayer Breakfast in Washington, Thursday, Feb. 4, 2016. 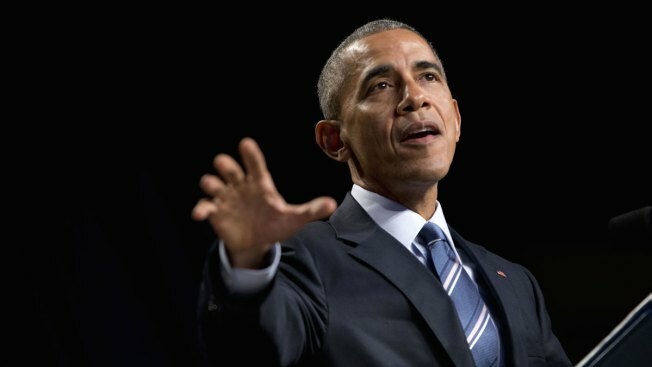 President Barack Obama on Friday pushed back against relentless Republican criticism of his economic leadership, saying his policies are paying off in "big tangible ways" and anyone who doesn't acknowledge that is "not telling the truth." With some of the remaining GOP presidential candidates accusing one another of lying, Obama stopped short of accusing them of doing the same regarding his record. He bristled at their claims that the economy remains weak and cited 71 consecutive months of job creation and an unemployment rate that has fallen by more than half to 4.9 percent. "You don't hear a lot about this from the folks who are on the campaign trail," Obama said. "Anybody who says we are not absolutely better off today than we were just seven years ago, they're not leveling with you, they're not telling the truth." "By almost every economic measure, we are significantly better off," he said. The office of House Speaker Paul Ryan, R-Wis., disagreed and argued that Obama's policies have led to one of the slowest economic recoveries in U.S. history. Among those policies is the Recovery Act, the $760 billion economic stimulus bill Obama pushed through Congress with scant Republican support just weeks after he took office seven years ago in an attempt to halt the worst economic downturn in generations. "The results speak for themselves," Ryan's office said in a statement. "Stagnant wages, weak job growth, millions of Americans still unemployed and millions more living in poverty." The statement said: "These are not signs of economic recovery; they are signs of a weak economy held back by the federal government." Obama made his case for the Recovery Act during a visit to a Saft battery plant in Jacksonville, Florida, which was built using stimulus money. With just months left in office and the Republican presidential candidates criticizing his leadership on all fronts, Obama is trying to burnish his legacy as the president who pulled the country back from the brink of a depression. He visited Detroit last month to highlight the resurgent U.S. auto industry, which was aided by a federal bailout. Stimulus money was spent on transportation infrastructure, clean energy and other public investments. It was also used to cut taxes for middle-class and working families, provide businesses with tax relief and offer assistance to financially strapped states. More than $90 billion was spent to boost the clean energy industry to help shift the country away from foreign oil and create jobs. Despite some high-profile failures on that front, Obama sees spending on the burgeoning industry as a bright spot of the stimulus. The solar company Solyndra was the first company to get a federal loan guarantee under an existing program that Obama expanded under the stimulus. But the company failed soon after receiving the guarantee, at a cost to taxpayers of more than $500 million. Republicans and other critics have cited Solyndra as an example of wasteful spending under a program they say did little to boost the economy while driving up federal deficits. Economists generally believe the stimulus program helped keep the recession from spiraling into another depression. A survey of economists by the University of Chicago found that 82 percent believed the stimulus spending had pushed unemployment lower by the end of 2010 than it would have been without the spending. Just over half of the economists surveyed, 56 percent, said the benefits of the stimulus exceeded the costs. Obama noted that the Saft lithium-ion battery plant didn't exist when he took office. The company won a $95.5 million Recovery Act grant and matched that money to build the factory, which opened in 2011 and created 280 jobs. "This was an example of the fruit of those investments that we made," Obama said.